Kiwanis is a global organization of volunteers dedicated to improving the world one child and one community at a time. The Kiwanis Club of Tellico Village is dedicated to serving the local community through various services and fundraising projects. Our club has been in service to our community for more than sixteen years. 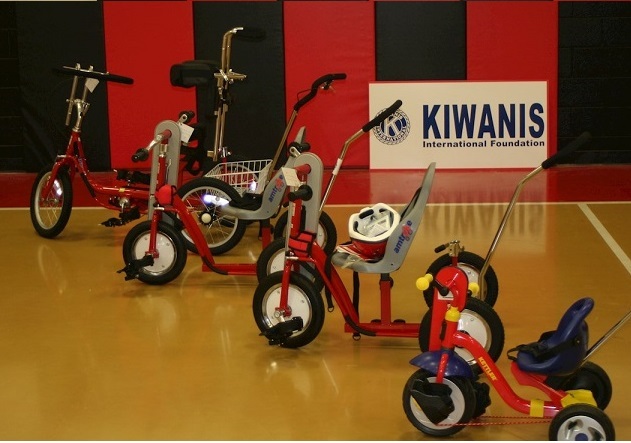 We are part of Kiwanis International, an organization serving children for over 100 years. Our Kiwanis club participates in a variety of projects throughout the year that involve fundraising, community service, and assisting children locally and worldwide. Additionally, we have speakers at our bi-weekly meetings to explore topics of interest to the membership. We engage in a number of social activities to share experiences, talents and our collective interests. All represent great opportunities for service, friendships and personal growth. Below are some of the projects and activities in which we are currently involved: For a complete listing of our projects click on the following link. Tutor children under the direction of a teacher. An important program that has helped improve the progress of LCES to very high ratings. The Amtryk program is one of the club's signature undertakings. An Amtryk is a tricycle specifically designed to match the special needs of a child with physical or mental challenges. The club works with physical therapists in the community to identify these special children for whom and Amtryk would be a benefit. The program has been recognized by the KY-TN District as well as Kiwanis International as an outstanding contribution to our kids. The Kiwanis Club of Tellico Village was chartered as one of 7,700 clubs in 80 countries in 1999. Our motto is "Serving the Children of the World". On March 16, 1999 the Kentucky-Tennessee District of Kiwanis International chartered the Kiwanis Club of Tellico Village sponsored by the Kiwanis Club of Sweetwater. The Club became part of Division 4 of the Kentucky-Tennessee District. The Kiwanis Club of Tellico Village has succeeded in attaining the Distinguished Club Award every year of its existence. It boasts having many Kiwanis International Hixon Fellows, Distinguished Presidents, Lieutenant Governors, and one District Governor. We'd love to tell you more about our club. Below are the best reasons to join. If interested, click the Join link at the bottom of this section and fill out the form. We look forward to hearing from you! We believe that those who give the most are the happiest. There is nothing more beautiful than individuals who reach out to make other people’s lives beautiful. It teaches us the value of service to others and shows us how important our contributions are in making this world a better place most especially for the children. Membership provides education in human relations and personal development. Being in service to others develops good character in every person. It gives us experiences that teach and develop us to become better individuals. Being a member allows one to take part in the many activities and projects we create. We have a great group of members who enjoy spending time with each other for the betterment of our community. The Kiwanis calendar events are posted in the TellicoLife Calendar, using the prefix Kiwanis. Visit our website: www.kiwanistellicovillage.org for additional Kiwanis Club information and to see the complete calendar click on the following link.